Are your old hardwood stairs cracking or faded? Or is your carpeted staircase dirty and getting harder to maintain? A new stairway greatly improves the appearance and value of your home. Stair-Treads.com is your online solution for new stairs. Providing its customers with premium wood products, Stair-Treads.com has everything you will need when replacing old carpeted stairs or installing new stairs in your home. Stair-Treads.com helps you eliminate expensive installation crews by providing products which anyone with basic construction skills can install and also provides resources online which will help you with your new set of stairs every step of the way. 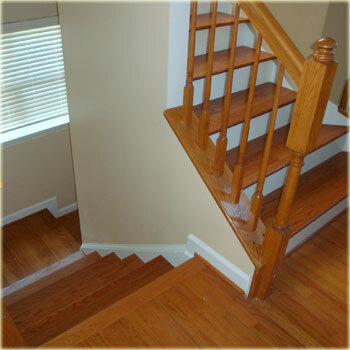 Stair-Treads.com also offers over-the-phone and e-mail support, so if you need assistance in any way, Stair-Treads.com's expert staff will assist you in making your home improvement project an inexpensive and successful do-it-yourself project. Stair-Tread.com's enormous selection of products ensures that you will be able to create a new stairway in your home that will match both your individual taste and budget. And because Stair-Treads.com's products are of the finest quality, your new stairway will be made to last. The 1" thick stair tread has been the industry standard and key component for constructing new stairs for generations. If your old wood stairs are losing their color and are beginning to break, Stair-Treads.com's standard 1" thick stair treads are the prefect drop-in solution. The 1" thick x 11-1/2" wide stair tread can typically be used to replace an old stair tread with little or no modification to the existing stairs. If you're upgrading a pre-fab staircase (where the treads are mortised into the stringers), or you don't want to remove the existing step tread, Retro-Fit stair treads are your answer. Retro-Fit stair treads are designed to reface your existing stairs rather than replace them. So obtaining a new stairway in your home does not have to involve demolishing your old one and typically costs a fraction of other options. Along with stair treads and risers, Stair-Treads.com carries all the products you will need when you look to install new stairs or improve upon your old stairway. Add ambience and charm to your home today with new stairs from Stair-Treads.com. Browse the website or contact us today. Your path to new, superior stairs begins at Stair-Treads.com.